Without the hint of an ice cream in sight, John and Simon made the most of the opportunity to travel to Brighton to visit Indigo Distribution’s brand new south coast Showroom, to check out the very first European Krix Demo Room featuring a Krix MX20 modular speaker system. The beauty of the Krix is that the entire front speaker is concealed behind an acoustically transparent projector screen – delivering brilliant sound and looking amazing. What’s involved to make this dream a reality? Your cinema system will be created with the speakers mounted behind the screen which reduces the space but is visually appealing. A false wall will be built around the outer edge of the on-wall speaker installation to fill in any remaining space. This is the point where the purposeful Krix MX20 modular speaker system sees the light of day for the last time as the projector screen frame and acoustically transparent screen material are fitted, completing the look. The delicacy, impact and scale produced by the Krix MX20 cinema speaker system is a sound like no other. The system is a 5.2.2 configuration, featuring two rear surround channels and two in-ceiling Atmos channel speakers to partner the concealed front left, centre and right channels with two subwoofers. The system electronics are discretely located at the rear of the room, minimising the visual distraction of the necessary and important hardware. 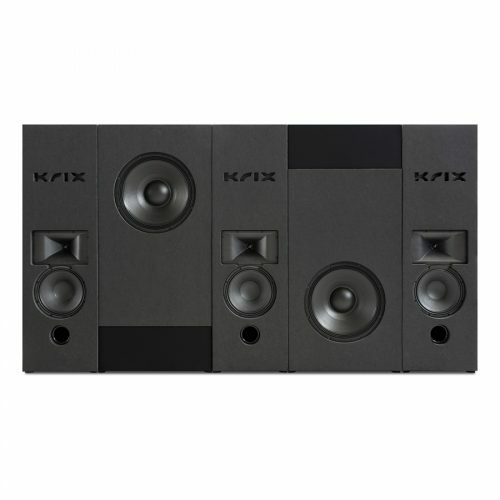 The Krix MX20 cinema speaker system is a very attractive and refreshing alternative to conventional cinema speaker packages commonly offered in the UK. Anyone with a reasonable budget and enough room to dedicate space to a cinema will not be disappointed! If you want to create the home theatre of your dreams, with stunning surround sound and a simple yet elegant design, contact us today or drop by and visit our showroom!